Washington, D.C. — Phyllis Schlafly, founder and Chairman of Eagle Forum, released the following statement today regarding the postponement of elections for House Speaker and Rep. Kevin McCarthy's exit from the race. "Tryouts for Speaker continue," Schlafly said. "The kingmakers are so desperate for someone to carry their liberal priorities that they are trying to force Congressman Paul Ryan into a job he does not want. Proven by his record, Chairman Ryan would be the same type of leader as outgoing Speaker Boehner. Ryan voted to give special rights to homosexuals in 2007 (ENDA), he voted to bail out Wall Street in 2008 (TARP), and upon becoming Chairman of the Budget Committee in 2011, he used his position of power to help punish conservatives for voting their conscience. "This year, he voted to fund President Obama's unconstitutional amnesty, and as chairman of the powerful House Ways & Means committee, he championed the massive power giveaway to President Obama through Trade Promotion Authority. Just ten days ago, he voted to continue funding Planned Parenthood in spite of a federal investigation into their immoral practices." "This is not about personality, it's about principle. The grassroots want a Speaker who will lead a coalition government, where their voices are truly represented. Paul Ryan would continue the top-down approach to government and the culture of retribution for dissenting voices. Republicans should find a Speaker who is committed to conservative principles and who will stand up and fight to return power to the people." 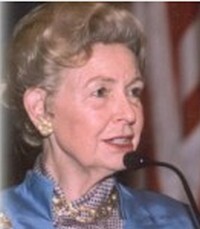 Tags: Phyllys Schlafly, kingmakers, forcing, Paul Ryan, House Speaker To share or post to your site, click on "Post Link". Please mention / link to the ARRA News Service. and "Like" Facebook Page - Thanks! Alabama. Photo credit: Luke Sharrett/Bloomberg. by Sean Hackbarth, Contributing Author: A federal appeals court delivered a big blow to the Obama administration’s attempts to use federal water regulations to amass unprecedented control over land use, The Wall Street Journal reports [subscription required]:A federal appeals court on Friday issued a nationwide stay blocking a new Environmental Protection Agency regulation that seeks to expand the amount of water and wetlands under federal protection. The Cincinnati-based U.S. Circuit Court of Appeals for the Sixth Circuit, in a split ruling, said it was prudent to block the regulation while litigation continued over whether the Obama administration’s effort was legal. The court’s order was a preliminary boost for a group of 18 states that challenged the EPA regulation, which seeks to add smaller bodies of water under federal water rules. "The sheer breadth of the ripple effects caused by the Rule’s definitional changes counsels strongly in favor of maintaining the status quo for the time being,” the court wrote. Therefore, EPA will have to stop implementing its Waters of the U.S. (WOTUS) rule until further actions by the court. “We should resolve the legality of the rule before having to fund the implementation of a very expensive, illegal rule," said William Kovacs, U.S. Chamber Senior Vice President, Environment, Technology & Regulatory Affairs. A federal judge in North Dakota came to a similar conclusion when blocking WOTUS in August. The Sixth Circuit Court questioned whether WOTUS fits with previous Supreme Court rulings. As I explained in July, Supreme Court Justice Kennedy’s 2006 Rapanos opinion created the “significant nexus” test for determining a federally-regulated body of water:In order to be considered a navigable water, a body of water must “significantly affect the chemical, physical, and biological integrity” of “waters that are or were navigable in fact or that could reasonably be so made.”“[I]t is far from clear that the new Rule’s distance limitations are harmonious with” Justice Kenney’s opinion, the court stated. The court was also critical of how EPA and the Army Corps of Engineers developed the final regulation, stating, “the rulemaking process by which the distance limitations were adopted is facially suspect,” and that EPA didn’t identify “specific scientific support substantiating the reasonableness” of its standards. 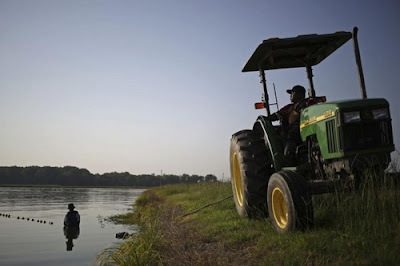 To use one example, under WOTUS, the federal government is claiming jurisdiction over waters, including ditches, canals, ponds, and wetlands, as far as 4,000 feet from a navigable water. That amounts to nearly every body of water in the United States. Any action that “pollutes” these waters, such as filling in a ditch or pulling weeds (activities an average person wouldn’t consider to be polluting) requires a costly federal land use permit. This makes it that much harder for farmers, home developers, small businesses, factories, and pretty much anyone who owns land to complete projects that can create jobs, generate economic growth, and better peoples’ lives. Sean Hackbarth is a policy advocate and Senior Editor at U.S Chamber of Commerce. He twitters at @seanhackbarth and is a contributing author at the ARRA News Service. Tags: Federal Court, EPA, Stop enforcing,Water Rule, Sean Hackbarth, U.S. Chamber of Commerce, To share or post to your site, click on "Post Link". Please mention / link to the ARRA News Service. and "Like" Facebook Page - Thanks! ARRA News Service - As reported previously today, 42 House Republicans betrayed the American people and added their names to a discharge petition to revive the now-defunct Export-Import Bank. Conservatives fought hard to ensure the Export-Import Bank was not reauthorized in June. These 42 members chose to side with President Obama and funnel corporate welfare to big government special interests. What is a discharge petition? A discharge petition is a rarely used maneuver that allows lawmakers to bypass multiple committees and bring a bill saving the Export-Import Bank directly to the House floor for a vote. Will it work? Today, these 42 Republicans joined with nearly every Democrat to secure 218 signatures and force a House vote later this month. There are still some legislative hoops to jump through, including Senate consideration which Mitch McConnell has ruled out. What is next for the Export-Import Bank? Conservatives must continue to stay vigilant and fight all attempts to revive this corporate welfare program. It is also imperative Republicans stand firm and vote “NO” on any legislation that includes the Export-Import Bank. 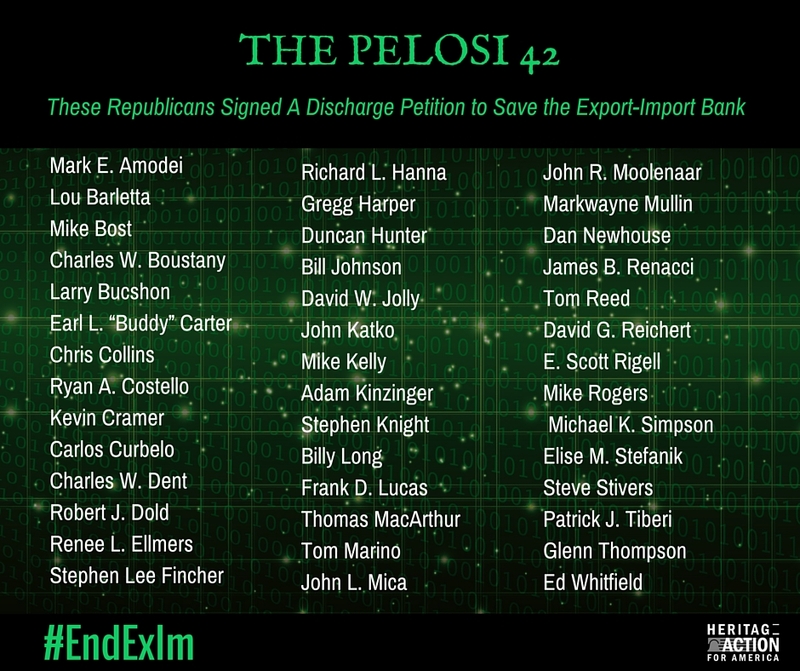 Did your member sign the Export-Import Bank discharge petition? 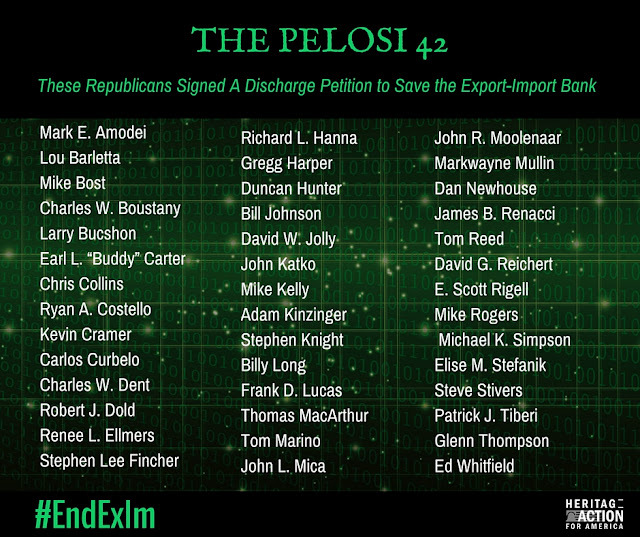 Tags: 42 Republicans, Nancy Pelosi, Ex-Im bank, discharge petition To share or post to your site, click on "Post Link". Please mention / link to the ARRA News Service. and "Like" Facebook Page - Thanks! by Gary Bauer, Contributing Author: Disarray? 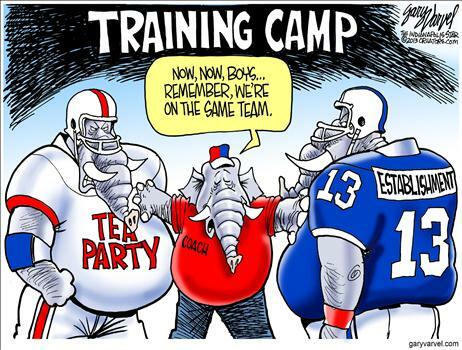 - Virtually every media outlet is declaring the Republican Party to be in a state of disarray, crisis or chaos. And the left-wing talking heads can hardly contain their glee. But what the media call disarray is just competition and debate about which leader is best able to fashion a strategy for dealing with a president who is willing to do almost anything to ram his agenda down the throats of the American people -- with or without Congress. Reports today indicate that Obama is preparing to use executive actions to bypass Congress in order to further restrict Second Amendment rights. If journalists want to write about disarray, the focus shouldn't be what happens over the next week or two in the House. Instead, they should look at the country's domestic and foreign policies under Obama. "Disarray," "crisis" and "chaos" pretty well sum up Obama's foreign policy. How about the White House being shocked and puzzled about Russia's intervention in Syria? If disarray is your thing, how about spending two years negotiating with Iran, getting a terrible deal, followed immediately by Iran stepping up its aggression and refusing to talk anymore? The president claims this is part of his legacy. I agree -- and what a sorry legacy it is. How about a Veterans Administration that allowed our heroes to die waiting for treatment? That's what you get with government-run, rationed health care. "Disarray," "crisis" and "chaos" are also good descriptors of Hillary Clinton's presidential campaign. Consider her repeated explanations for her mishandling of classified information on a private email server. How about her opposition to one of the president's signature initiatives -- the Trans Pacific Partnership -- something she repeatedly championed? Isn't that disarray and chaos in the ranks of the left? The boisterous competition among House Republicans for a new speaker pales by comparison to the disarray and chaos of Obama and Clinton! Establishment Elites Are Losing - The competition in the House mirrors the competition in the Republican presidential primary, where three outsiders (Trump, Carson and Fiorina) command more than 50% support. In contrast, three prominent establishment insiders (Bush, Kasich and Christie) have 14% combined. The presidential race and the House competition for speaker have nothing to do with the media's favorite narrative of "radical extremists trying to control the GOP." Here's proof: A recent Fox News poll found that 62% of Republican voters felt "betrayed" by congressional Republicans and 66% said the GOP Congress had "failed to do all it could" to fight Obama's agenda. Overwhelming majorities of Republican votes are not feeling betrayed because their party has been "too conservative." It's completely the opposite -- Republican voters think conservatism is missing in action. It seems the establishment elites are losing! Even one Washington Post columnist sees it: "There is a revolution happening within the Republican Party right now. The establishment's hold on power is more tenuous than it has been at any time in recent memory." Iran Deal Illegal - Several commentators have declared the Iranian nuclear deal to be the "Obamacare of foreign policy." They are right -- and in more ways than one. Not only is it incredibly bad policy, it was also badly written policy. In fact, a new analysis indicates that at least one part of the agreement, dealing with the foreign subsidiaries of U.S. companies, is illegal. "As the Iran deal is an 'executive agreement' and not a treaty . . . legal analysts inside and outside of the Obama Administration have concluded that the [Joint Comprehensive Plan of Action] is vulnerable to challenge in the courts, where federal case law had held that U.S. statutes trump executive agreements in force of law. "No doubt many of you will recall Senator Tom Cotton's public letter regarding the Iran deal. Cotton correctly observed that because the deal was merely an executive agreement and not a formal treaty, it lacked the full force of law and was not binding on the next administration. For stating the obvious, the left-wing media and Democrats accused Senator Cotton of treason. Senator Cotton was right. He and his fellow Republican senators should write another public letter addressed to every American CEO warning them that it remains illegal for their foreign subsidiaries to do business with Iran. Media Manipulation - Remember Ahmed Mohamed? He was the Texas teenager who supposedly made a clock that looked a lot like a bomb, took it to school and got arrested. The politically correct media ran wild with the story. During a press conference with representatives of CAIR, his father, Mohamed Elhassen Mohamed, defended Ahmed, saying that he just likes to fix things. "But because his name is Mohamed and because of Sept. 11, I think my son got mistreated," he added. Speaking of 9/11, it seems that the elder Mohamed is a "9/11 truther." In other words, he doesn't believe Islamists attacked us on 9/11, but that George W. Bush attacked us. Kudos to Breitbart's investigative journalism for uncovering this. Of course, the liberal media, heavily invested in the Muslim-as-victim narrative, will never mention it. Tags: Gary Bauer, Campaign for Working Families, Disarray, media, elites losing, Iran Deal Illegal, Media Manipulation To share or post to your site, click on "Post Link". Please mention / link to the ARRA News Service. and "Like" Facebook Page - Thanks! by Dr. Bobby Eberle: In what has become an all-too-frequent occurrence, Fox News wasted no time taking a swipe at conservatives. We've seen it plenty of times now -- from commentators having meltdowns because their establishment candidate isn't the frontrunner to openly criticizing conservatives as out of touch or crazy. Now, the race for Speaker of the House is up in the air, and Fox News has singled out a certain conservative candidate as the possible culprit. Some of the Fox News bias really came to light with the ascendance of Donald Trump. Trump is certainly no conservative, but he speaks out against the politically correct establishment and the media. As such, candidates such as Jeb Bush (a Fox News favorite) are directly in his line of fire. This caused such turmoil at Fox News that they launched an all-out assault on Trump. Just think back to the first presidential debate if you have any doubts as to whose corner Fox News was NOT in. Now, we have the fall of House Speaker John Boehner who decided to resign rather than face a possible ouster by a growing faction of disgruntled conservatives. His presumed establishment successor, Kevin McCarthy, also saw the writing on the wall and withdrew from the race knowing that he did not have the votes to win. So... Baier blames Ted Cruz for McCarthy's fall??? Baier makes it sound as if Cruz is engaged in a sinister plot by meeting with the Freedom Caucus. How dare conservatives actually meet and demand that things get done! 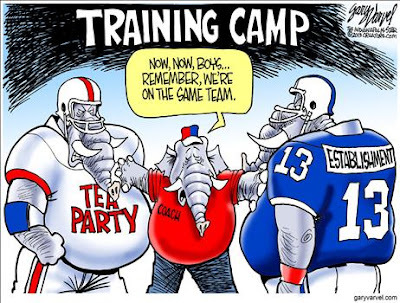 Then Baier claims that Cruz exerts "undue influence" on the caucus?? What does that even mean? It's just a line thrown out there to paint Cruz in a bad light. So, what's the purpose of those comments? They added nothing to the debate or the discussion but merely guided viewers down a path that makes Cruz look like the bad guy. It's disturbing that Fox News seems to be no different than so many of the establishment Republicans in Washington. They talk and preach conservatism just as long as nothing really gets done. With people like Trump and Carson on the rise and people like Boehner on his way out, the Beltway elite must shaking right now. But will anything change? Dr. Bobby Eberle is a conservative political analyst, writer, commentator and founder of GOPUSA.com. 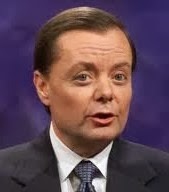 He has served in conservative, Republican leadership roles at the county, state, and national levels and was a delegate to the 2000 Republican National Convention and covered the 2004 Republican National Convention as a member of the Internet media. He served as the State Chairman for the Texas Young Republican Federation and Vice Chairman at Large for the National Federation. As a fellow conservative GOP activists, and online author, the ARRA News Service occasionally promotes his articles. Tags: Bobby Eberle, GOPUSA, Fox News, Jab, Conservatives To share or post to your site, click on "Post Link". Please mention / link to the ARRA News Service. and "Like" Facebook Page - Thanks! by Phyllis Schlafly: The Republican Establishment designed the process to deliver the 2016 presidential nomination to a business-friendly moderate who avoids so-called social issues. The consultants who rewrote the party rules after 2012 are now trying to explain to their patrons what went wrong and how to fix it. Plan A, of course, was to assure the nomination of Jeb Bush, whose views are the perfect reflection of the Republican donor class. But despite many months of campaigning, $114 million of political funds raised through June 30, and two presidential debates watched by a record-setting average of 24 million people, Jeb Bush has dropped to sixth place, registering only 4% in the latest Pew poll. One reason for Jeb’s poor performance is that he never learned from Ronald Reagan’s example how to prepare for a presidential campaign after his narrow defeat at the 1976 Convention in Kansas City. Reagan then traveled the country speaking to small audiences of grassrooters and fielding their questions. The immigration issue, and the way it has grabbed the attention of the grassroots, made it difficult for Jeb Bush to secure the Republican Party nomination in the usual way. Bush will continue to try, of course, and may be able to play insider politics to line up more endorsements and donors with wads of political money. But the kingmakers always have a Plan B if their first choice stumbles. In 1964, for example, Pennsylvania Governor William Scranton was carefully groomed as a second-choice alternative who could jump in the race after Nelson Rockefeller failed to stop the conservative Barry Goldwater. Speculation has been in the media that Marco Rubio, Scott Walker, or Chris Christie is the Plan B for the Establishment in case Jeb Bush fails to gain popular support. But Rubio is tied for only fifth in Iowa and fourth in New Hampshire, Christie has failed to gain any real support and Walker has dropped out completely. When Jeb Bush and some of these other candidates tried criticizing Trump, polls showed that any loss in support for Trump simply went to another outside-the-Establishment candidate, such as Ben Carson or Carly Fiorina. So Plan B is striking out as badly as Plan A did. It may be that the only alternative left for these Republican would-be kingmakers is the late entry of a new candidate to enter the race. We are already hearing rumblings about resurrecting Mitt Romney. On the Democratic side, Vice President Joe Biden has been considering whether to enter the race, so it is obviously not too late for a new candidate to emerge. Indeed, an entirely new candidate could be nominated as late as the Republican National Convention next summer in Cleveland, as occurred at the famous Republican convention of 1880. The grassroots must be vigilant to anticipate and counter the attempts by Republican insiders to impose an unwanted candidate on the American people. When we fought for and nominated Barry Goldwater in 1964, we did not win the general election that year but we built the conservative movement and laid the foundation to win five out of the next six presidential elections. When the Establishment is allowed to pick the Republican nominee, a candidate unable to win the support of the all-important middle-class America results. Establishment candidates have been unable to win the popular vote in five out of the last six elections, and that outcome is not something any Republican should want to repeat. Tags: Phyllis Schlafly, Eagle Forum, Republican Establishment, new, Plan B, Editorial Cartoon, Gary Varvel To share or post to your site, click on "Post Link". Please mention / link to the ARRA News Service. and "Like" Facebook Page - Thanks! by James Stafford, Contributing Author: While other commodities are floundering or completely collapsing in this market, lithium—the critical mineral in the emerging battery gigafactory war—is poised to explode, and going forward Nevada is emerging as the front line in this pending American lithium boom. Most of the world’s lithium comes from Argentina, Chile, Bolivia, Australia and China, but American resources being developed by new entrants into this market have set up the state of Nevada to become the key venue and proving ground for game-changing trade in this everyday mineral. Nevada is about to get a boost first from Tesla’s upcoming battery gigafactory, and then from all of its rivals. For several years, experts have been predicting a lithium revolution, and while investors were being coy at first, the reality of the battery gigafactories is now clear, and nothing has hit this home more poignantly than Tesla’s recent supply agreements with lithium providers who will be the first beneficiaries of this boom, followed by a second round of lithium brine developers that are climbing quickly to the forefront. Tesla — which will require large quantities of lithium at cheaper prices -- has already signed agreements to purchase lithium from Canadian Bacanora Minerals Ltd and British Rare Earth Minerals Plc. in Mexico but has indicated that it is looking closer to home, and particularly in Nevada, which is ground zero for Tesla’s battery units. For Nevada, there can be no more significant validation than Tesla’s lithium supply agreements. Albemarle Corp. already has the producing Rockwood mine, but Tesla and other gigafactory contenders are concerned about new lithium resources. And the newest entrant on this scene — Dajin Resources Corp - has two projects in Nevada, only a short distance from Albemarle’s Rockwood producing mine and in close proximity to Pure Energy Mineral’s lithium development project, which just signed a preliminary supply agreement with Tesla. Focused on the exploration of energy metal projects, Dajin has strategically located targets in Nevada, including over 3,800 acres in Alkali Lake, which is only 12 kilometers from the producing Rockwood Lithium Mine. It also has the Teels Marsh project, which covers over 3,000 acres in the Mineral County desert lake basin and is about 80 kilometers away from producing mines and new exploration targets that are all on the site of a volcanic eruption that many believe could have contributed lithium. Where future supplies are concerned, investors will be looking closely at Dajin, which is 100% self-owned and operated. If it can post similar success in terms of exploring lithium brine, it could easily pop up as a favorite stock on investors’ radar. And the brine is the place to be, putting Nevada at the front line of the North American lithium revolution at a time when other minerals are collapsing. 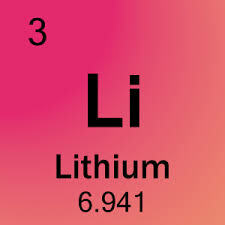 The lithium, found in salty water, or brines, is the most cost-effective on the market; it’s cheap and easy to extract, giving competing battery gigafactories new, affordable American lithium resources that will be a global game-changer. At the end of the day, Nevada has enough lithium brine to earn it a place among the key global venues—a list that for now includes the “Lithium Triangle” of Bolivia, Argentina and Chile, as well as China. Without lithium, there will be no battery gigafactories. In fact, one of these factories alone will need 15,000 tons of lithium carbonate a year just to get started—and the first is slated to come online as soon as next year. Construction has already started on Tesla’s battery factory, where the assembly lines are expected to churn out enough lithium-ion batteries for 500,000 electric cars, according to Fortune magazine, and it should be operating at full capacity by 2020. And the Tesla gigafactory is just the tip of this overall iceberg. According to a report from the Centre for Solar Energy and Hydrogen Research, more than one million electric vehicles will be on the road globally by the end of this year—that means a spike in lithium demand, which Roskill consulting and research predicts will more than double from 2012 to 2017. Even more than hybrid cars, grid storage and the ‘powerwall’ will drive lithium demand through the roof. In an interview with Reuters, General Electric said it expected this sector to quadruple to $6 billion by 2020 thanks to rising demand for industrial battery systems driven by increasing reliance on intermittent energy sources, such as wind and solar power, as well as the potential to add energy to the grid quickly when power needs spike. Now the game is all about new resources—and specifically, American resources, with all eyes on the brine. Tesla knows this, and so do its competitors. Investors who know this will get in on the game before these new entrants start producing. Tags: James Stafford, Oilprice.com To share or post to your site, click on "Post Link". Please mention / link to the ARRA News Service. and "Like" Facebook Page - Thanks! 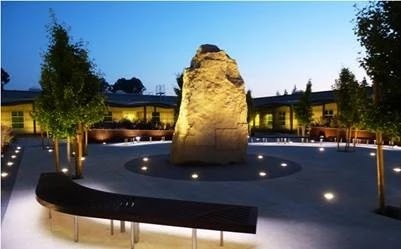 $482,960 for the sculpture and $807,310 for site prep.. The Executive Branch - in London today, U.S. Defense Secretary Ashton Carter announced the U.S. to end Syrian rebel training program and instead will work with Kurds. The House reconvened today at 9 AM. The House today took up H.R. 702 — "To adapt to changing crude oil market conditions." This bill if it becomes law would end the crude oil ban allowing the U.S to export oil to other countries. According to recent reports from IHS Inc. and the American Petroleum Institute, lifting the U.S. ban on crude oil exports would support up to 964,000 jobs, decrease domestic gas prices by 3.8 cents per gallon, reduce the trade deficit by $22 billion, and by 2020, increase government revenues by $13.5 billion. Additionally, the non-partisan Congressional Budget Office estimates that by enacting H.R. 702, government spending would be reduced by $1.4 billion over the next ten years. "Without any new loans from the Export-Import Bank, U.S. exporters managed to sell $188.8 billion of goods and services in July, and $185 billion in August. The reason almost nobody noticed the Ex-Im Bank's expiration on June 30 is simple. It only accounts for 1 percent of the nation's $2.344 trillion of annual exports. In other words, its expiration hardly matters at all when companies can just secure financing elsewhere in a global marketplace. "Yet 218 members of the House, including more than 40 House Republicans, have seen fit to give yet another bailout to companies like Boeing and General Electric, all so their customers can get guaranteed loans at a slightly lower interest rate. This blatant corporatism on display is just one more reason why the American people want to throw House leaders out on their ears. "This proves once again that the true majority of the House are Democrats and handful of Republicans. There isn't a major piece of legislation that has not depended on Democrats to pass, and this is no more apparent than in this extension of the very corporate cronyism that has thoroughly corrupted Washington, D.C.
"Perhaps, the rest of the House Republican Conference will finally wake up and discover that their problem isn't those who are pushing them to stand up for conservative principles, but instead it is the handful of their Republican colleagues who regularly vote with the Democrats creating a center-left majority that feeds the corporate state." The Senate has adjourned for Columbus Day recess. Senators are back in their states to meet with constituents. The Senate will reconvene for legislative business on Monday, October 19th. Yesterday, Senate Majority Leader Mitch McConnell filed for cloture on the motion to proceed to H.R. 2146, a bill that would penalize “sanctuary cities” which refuse to abide by immigration laws. A vote on moving to the bill will be held when the Senate returns. Also yesterday, Senate Democrats filibustered yet another appropriations bill, H.R. 2028, the Fiscal Year 2016 Energy and Water appropriations bill. Democrats have now filibustered bills to fund our troops, support our veterans, and to maintain our energy and water infrastructure. According to CNN, “Frustrated Senate Democrats conceded Thursday that even in the aftermath of several mass shootings, they don't have enough votes right now to push through gun control legislation. So they will try to build grassroots support by urging Americans to insist the Republican-controlled Congress act. . . .
“At a news conference on the Capitol steps, Democratic senators from states where mass shootings killed dozens of people outlined three ‘principles of action’ they want adopted to curb gun violence. 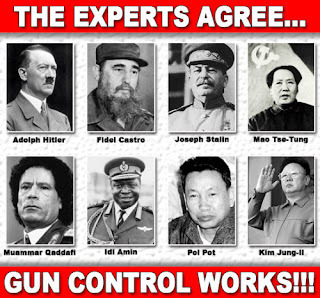 Those ideas center on improving background checks and curbing illegal gun sales to keep weapons from the many unstable people behind these shootings. . . .
Krauthammer explains, “So with the Roseburg massacre in Oregon. Within hours, President Obama takes to the microphones to furiously denounce the National Rifle Association and its ilk for resisting ‘common-sense gun-safety laws.’ His harangue is totally sincere, totally knee-jerk and totally pointless. At the time he delivers it, he — and we — know practically nothing about the shooter, nothing about the weapons, nothing about how they were obtained. “Nor does Obama propose any legislation. He knows none would pass. But the deeper truth is that it would have made no difference. 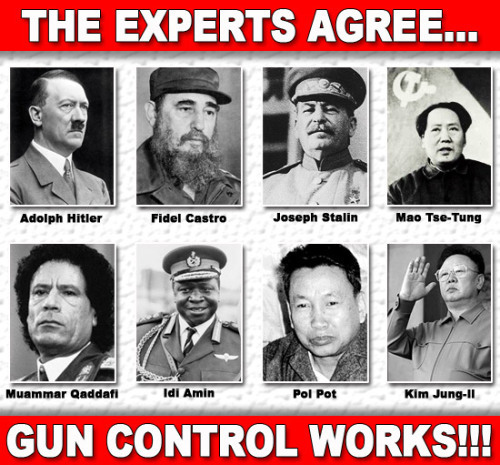 Does anyone really believe that the (alleged) gun-show loophole had anything to do with Roseburg? Universal background checks sound wonderful. But Oregon already has one. The Roseburg shooter and his mother obtained every one of their guns legally. “The reason the debate is so muddled, indeed surreal — notice, by the way, how ‘gun control’ has been cleverly rechristened ‘common-sense gun-safety laws,’ as if we’re talking about accident proofing — is that both sides know that the only measure that might actually prevent mass killings has absolutely no chance of ever being enacted. . . .
Krauthammer concludes, “Committing the Jared Loughners would have an effect. But even they are the exception among the shooters. Yet ‘common-sense’ gun control would do even less. Unless you’re willing to go all the way. New report on the Veterans Administration diverting money from needed programs for Veterans: The Washington Posts reports: VA spent $6.3 million on sculptures and fountains for their hospitals. Tags: Congress, recesses, House, bill, ending Crude Oil Export Ban, Democrats, gun control, charade, House, discharged reauthorization, Export-Import Bank, Veterans Administration, VA, sculptures To share or post to your site, click on "Post Link". Please mention / link to the ARRA News Service. and "Like" Facebook Page - Thanks! by Bob McDowell, Contributing Author: My attention was recently grabbed by a story in the daily Tulsa paper that bore the headline: "Crude oil trade with Mexico approved". The by-line credit was to Josh Lederman of the Associated Press. It also carried a sub-headline of "U.S. energy industry applauds the White House’s decision. The gist of the story was that the Obama Administration had approved ‘limited crude oil trading with Mexico’. It went on to state that the ‘state-run’ oil company, Pemex, wished to import 100,000 barrels per day of higher quality crude from the US in trade for an equal “volume” of their low quality (heavy) crude. The trade that was approved by misguided officials who have demonstrated no loyalty to our citizens. At the well-head here at home, crude oil is purchased at prices that vary according to the ‘API gravity’ of the crude, with the posted price being for 40 degree crude and at least, used to be, reduced $0.02 per degree less than 40. Thus, common sense would dictate that a non-cash trade should carry a much larger volume from them in trade for the oil delivered by us. Further, the refineries along the Gulf are more able to process successfully this type of lower gravity crude. That is the main purpose for the Keystone XL Pipeline proposed from Canada, where crude is lower grade, to the Gulf. Approval for this has been delayed for more than six years resulting in the recent announcement that the North Dakota regulatory board was forced to re-open their approval because of the requirement that construction begin within five years of original approval. Most people today were not alive back in the 1930's when the Mexican oil production was found and developed by U.S. corporations and then ‘stolen’ by ‘expropriation’ by the Mexican Government. There was no compensation. Under their operations, the production has declined and equipment deteriorated. This action has been copied in later years by a number of other nations, such as Venezuela, to the financial detriment of our stockholders. If memory serves me correct, in not one of those ‘grand thefts’ did the U.S. take any actions against the stealing nations. All this makes it clear to me that those in our government, whether elected, appointed, or employed, carry no personal loyalty to the U.S. citizens and to their stock holdings in international corporations. 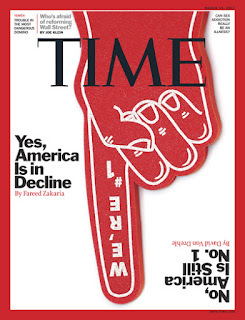 It has long been my conviction that in our relations with foreign nations we should follow an inflexible policy that whatever a nation’s rules toward our citizens are will be in return the same way we treat their nationals and corporations in our country. This seems only fair to me. It offends me that our spineless government personnel refuse to put forth any pretense of following such a policy or protecting American businesses from foreign exploitation. Along that line, I received an email some time ago which outlined the Mexican govrnment’s attitude toward any people who crossed their borders illegally. The consequences were somewhat brutal. And yet, the Mexican Government facilitated the crossing of their nation, on their trains, by tens of thousands of "children" from countries to their South for their intent to illegally invade the U.S. Their actions do not indicate any sort of friendship by the Mexican Government toward the Unites States. 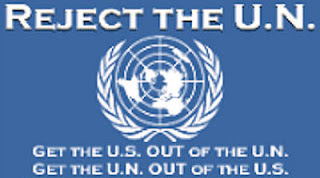 We desperately need some LOYAL government leaders and personnel in all levels of the U.S. government who place the best interests of our REPUBLIC and its LEGAL population first in dealings with the other nations. As always, the ultimate fault lies with the voting population who continue to elect people who fail to have that loyalty and patriotism. If a voter has no information on a candidate, it would be wiser to leave blank that place on the ballot. Tags: Bob McDowell, Disloyal, Federal Leadership, businesses, trade, corruption, foreign government, illegals, U.S. Government Officials To share or post to your site, click on "Post Link". Please mention / link to the ARRA News Service. and "Like" Facebook Page - Thanks! by Paul Jacob, Contributing Author: Sheila Weinberg wants to raise your taxes. So fervent is her money-lust that she even threatens to run for president, and only half-jokingly, on that single issue. More surprising: I would enthusiastically vote for her. Well, Weinberg isn't demanding a tax increase or a spending cut, per se -- just one and/or the other until accounts are balanced. She points out that tax increases tend to concentrate the minds of taxpayers to oppose greater spending by government. 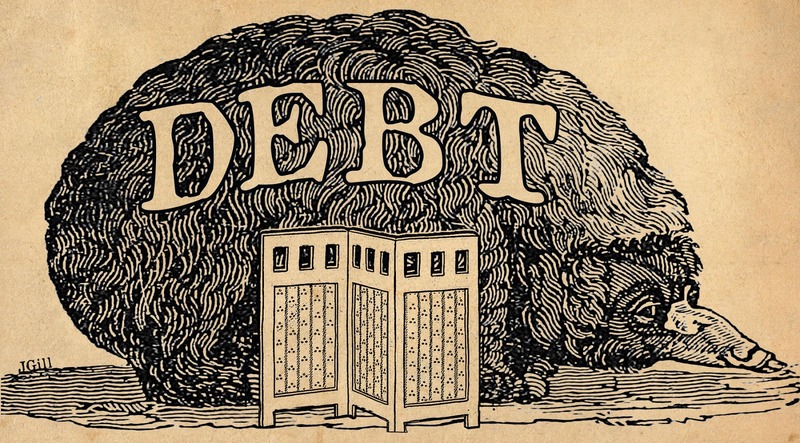 Otherwise, as long as governments -- local, state and federal -- can hide the true costs of their "services," more will be spent, and more debt incurred, than the people can afford, or want. That's why this friendly CPA founded Truth in Accounting, a nonpartisan, non-profit group working to "compel governments to produce financial reports that are understandable, reliable, transparent and correct." Too much to ask? No, if you ask me, or you, or Sheila, or anyone else . . . until we inquire of politicians, and then, well . . . apparently, yes. And not merely at the federal level. "For years, citizens have been told that their home state budgets have been balanced," Weinberg recently told Watchdog.org. "If that were true, state debt would be zero . 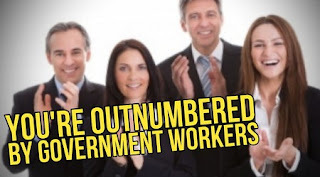 . ."
Yet, last month, Truth in Accounting issued its 2014 Financial State of the States report disclosing that state governments are truthfully -- whether they admit it or not -- a cumulative $1.3 trillion dollars in arrears. 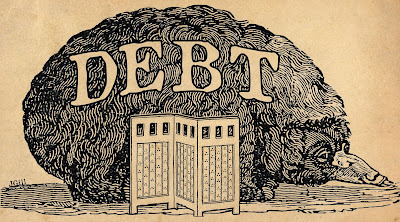 Individually, all but 11 states are carrying debt. Lies won't set us free. Or pay the bills. Tags: Paul Jacob, Common Sense, Raising Taxes, Truth To share or post to your site, click on "Post Link". Please mention / link to the ARRA News Service. and "Like" Facebook Page - Thanks! Ken Blackwell, ARRA News Service Contributing Author, Family Research Council Senior Fellow and former Ambassador and Ohio Sec. of State, discusses with Steve Malzberg on Newsmax the latest developments into the Hillary Clinton email investigation, his high hopes for Carly Fiorina, and insights on the Ben Carson, Donald Trump campaigns, and how once again the recent tragedy in Oregon shows that President Obama is a "master of division" and not a "uniter." Tags: Ken Blackwell, ARRA News Service, Newsmax interview, Steve, Malzverg, Hillary Clinton's email investigation, Carly Fiorina, Ben Carson, Donald Trump, Jeb Bush, tragedy in Oregon, mass shooting, President Obama, master of divsionTo share or post to your site, click on "Post Link". Please mention / link to the ARRA News Service. and "Like" Facebook Page - Thanks! Do Something! . . .
. . . Mentally ill and guns don't mix, so why are they going after the law abiding citizen's guns, making it harder to defend ourselves from criminals and crazies. 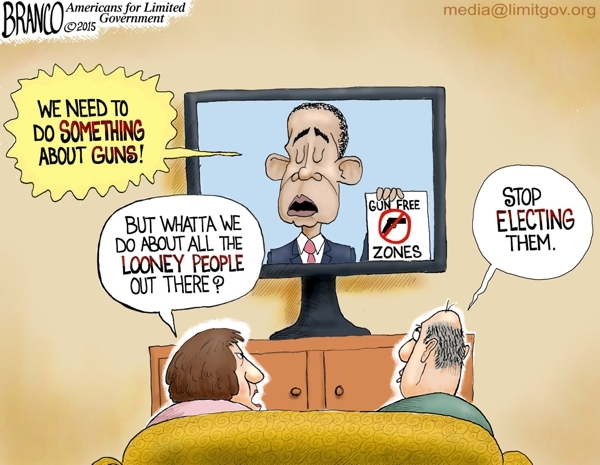 Tags: do something, stop electing, looney people, mentally ill, President Obama, gun control, second amendment, editorial cartoon, AF Branco To share or post to your site, click on "Post Link". Please mention / link to the ARRA News Service. and "Like" Facebook Page - Thanks! Senate Dems Push Gun Control Measures & Obama Agrees: "This Is Something We Should Politicize"
today the House may take up H.R. 538 "To facilitate the development of energy on Indian lands by reducing Federal regulations that impede tribal development of Indian lands, and for other purposes, and providing for consideration of the bill (H.R. 702) to adapt to changing crude oil market conditions." Yesterday the House passed 303-121 H.R. 3192 — "To provide for a temporary safe harbor from the enforcement of integrated disclosure requirements for mortgage loan transactions under the Real Estate Settlement Procedures Act of 1974 and the Truth in Lending Act, and for other purposes." The major dust up in the House today was the announcement that Rep. Kevin McCarthy (R-CA) has ended his bid to become the next speaker of the House of Representatives. Full Story here. The Senate reconvened at 9:30 AM today. At 10:45, the Senate began consideration of the motion to proceed to H.R. 2028, the Fiscal Year 2016 Energy and Water appropriations bill. At 12:45 PM, the Senate voted 49-47 on the cloture motion on the motion to proceed to (i.e. whether to take up and debate) H.R. 2028. Senate Democrats have now filibustered three appropriations bills. The last two they blocked would have funded our troops and programs for our veterans. Yesterday, the Senate voted 70-27 to approve the conference report for the Fiscal Year 2016 Defense authorization bill, H.R. 1735. The bipartisan Pentagon policy bill now goes to the White House, although President Obama has said he will veto it at a time of escalating crises throughout the world. Last week, President Obama said, “There’s been another mass shooting in America -- this time, in a community college in Oregon. … Well, this is something we should politicize.” Today, Senate Democrats appear to be taking him up on his invitation. As of yet, Democrats have produced no bill and thus have no actual proposal to vote on. And a ban on so-called “assault weapons”, put forward by Sen. Dianne Feinstein (D-CA) at the same time, was rejected with 60 no votes. Tags: Democrats, gun control, filibuster defense bill, To share or post to your site, click on "Post Link". Please mention / link to the ARRA News Service. and "Like" Facebook Page - Thanks! 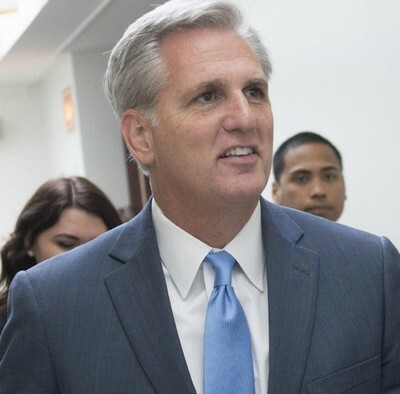 by Rob Bluey: Rep. Kevin McCarthy, R-Calif., has ended his bid to become the next speaker of the House of Representatives. McCarthy, the current GOP majority leader, was the leading candidate among the three Republicans seeking the job. However, he lacked the 218 votes needed to win a vote on the floor after the conservative House Freedom Caucus endorsed Rep. Daniel Webster, R-Fla. Rep. Jason Chaffetz, R-Utah, is also running for the job. “I am not the right person to lead at this moment,” McCarthy reportedly told his Republican colleagues at a meeting today. He elaborated at a press conference Thursday afternoon. McCarthy’s decision forced Republicans to postpone today’s speaker election. Speaker John Boehner, who will resign Oct. 30, said in a statement that he would stay on as speaker until a new person is chosen. The speaker does not have to be a member of Congress. The news apparently stunned members of Congress who were in the room with McCarthy. Rep. Darrell Issa, R-Calif., spoke to reporters afterward to explain what happened. Issa said McCarthy would like to remain in his majority leader post. Chaffetz, who currently leads the House Oversight and Government Reform Committee, told reporters he remains a candidate for speaker. Webster, who has the backing of the 40-member Freedom Caucus, is also still in the race. With the postponement of today’s vote, other candidate may emerge. Rep. Paul Ryan, R-Wis., who was going to nominate McCarthy at today’s meeting, reiterated he would not seek the job himself. "Kevin McCarthy is best person to lead the House, and so I’m disappointed in this decision. Now it is important that we, as a Conference, take time to deliberate and seek new candidates for the speakership. While I am grateful for the encouragement I’ve received, I will not be a candidate. I continue to believe I can best serve the country and this conference as Chairman of the Ways and Means Committee." Another Republican, Rep. Trey Gowdy of South Carolina, said he was uninterested in the job. Gowdy is currently leading the House’s Benghazi investigation, which became an issue for McCarthy after he suggested the House investigation had hurt former Secretary of State Hillary Clinton’s poll numbers. McCarthy apologized for his comments and told reporters Thursday those comments were a factor in his decision. In the lead up to today’s meeting, the Freedom Caucus, which is credited with pressuring Boehner to retire early, vowed to band together as a group and vote for Webster as a powerful voting bloc. Rep. Dave Brat, R-Va., mentioned upon leaving the meeting that “everyone’s surprised” and reiterated again that the Freedom Caucus, and other conservatives, are calling for a more open legislative process, where rank-and-file lawmakers could put bills and amendments on the House floor and have a larger say in picking committee chairmen. Brat noted that several policy issue confront Congress, including a debate over the debt limit, government spending, and Russia’s airstrikes in Syria. Another Republican, Rep. Louie Gohmert of Texas, also stressed process over personality. Rob Bluey (@RobertBluey) is editor in chief of The Daily Signal, the multimedia news organization of The Heritage Foundation. Josh Siegel also contributed to this story. Tags: Politicsm news, Speaker , The House, Kevin McCarthy, drops out, Rob Bluey, politics, news To share or post to your site, click on "Post Link". Please mention / link to the ARRA News Service. and "Like" Facebook Page - Thanks! by Jim Mullen, Contributing Author: We are trapped in a time of our nation's history when misfortunes, mismanagement, corruption, and leftwing ideology come together in a powerful concurrence of circumstances that leave our once dynamic nation at risk for disaster. Once upon a time, this nation stood tall flexing a mighty industrial complex, manufacturing base, and skilled labor force. Coincidently, it all remained largely unfettered by government. Undoubtedly, the next war will find a nation rife with the greatest fast-food workers in the world. Tags: Jim Mullen, Freedom for US Now, collapse, industrial, manufacturing base, Cyber Security To share or post to your site, click on "Post Link". Please mention / link to the ARRA News Service. and "Like" Facebook Page - Thanks! Let's Protect Intellectual Property Rights From "Big Fix"
by Ken Blackwell, Contributing Author: Fall is always a busy time on Capitol Hill. Members usually wait for this time of year to consider the most controversial and thorny issues like appropriation bills to keep the government open and tax legislation that expires at the end of the year. Deals are made and legislators look for any opening to sneak through supposed non-controversial legislation without much debate or fanfare. In this case, it’s especially important for conservatives to be on guard for attempts to push through so-called “patent reform.” In recent years, some in the Republican leadership have joined with the Obama administration to advance legislation aimed at reforming the patent system that is ingrained in our Constitution. 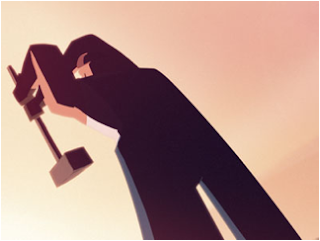 Supporters have claimed that it targets so-called patent trolls and rein in out of control patent lawsuits. In reality, these overhaul proposals would target all patent holders, not a targeted approach to address abusive behavior by trolls (which many support). In addition, patent lawsuits are actually declining according to a number of studies. Leading conservatives in Congress, like Rep. Jim Jordan, Rep. Tom Massie, Senator Ted Cruz and many others have expressed their reservation for this approach and saying it goes too far to undermine the rights of legitimate patent holders. Tags: Ken Blackwell, government, intellectual property rights, the "Big Fix", patent reform, To share or post to your site, click on "Post Link". Please mention / link to the ARRA News Service. and "Like" Facebook Page - Thanks!